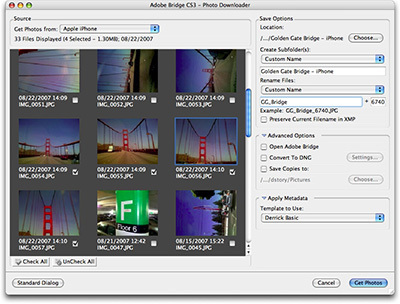 Bridge 2.0 (included with Photoshop CS3) now features the Get Photos from Camera command that gives you lots of options when downloading your pictures from a memory card to your hard drive. Yes, you could just drag and drop those same images without using Bridge, but you may want to take a second look first. Get Photos from Camera allows you to create a custom download folder, modify the file names of your pictures, and even add your copyright information -- all during the normal downloading process. So in about the same time as it would take you to drag and drop, you've accomplished a lot of housekeeping too. Plus, you can preview thumbnails of your photos before you initiate the download, and only pick the ones you want. Try that with drag and drop. And if that wasn't good enough, then how about Bridge's ability to save copies of your masters to a separate drive... automatically during the download! All you have to so is launch Bridge, go to File > Get Photos from Camera, and make a few choices. The first I recommend is a metadata preset with all of your contact and copyright info. Using Bridge is particularly nice for devices such as the iPhone that doesn't automatically add your metadata to its captured images. Time to get organized. If you haven't made the move to Apple Aperture or Adobe Photoshop Lightroom yet, then Bridge 2.0 will give you much of the same capability when importing your images. Kodak's latest announcements are right in line with the direction that consumer photography is moving. Take for example the Easyshare Z812 IS Zoom Camera. It's compact enough to fit in your jacket pocket, but captures stills and video in 16:9, and includes all of the bells and whistles that you'd expect from a state of the art digicam. Other impressive specs include the 12X SCHNEIDER-KREUZNACH VARIOGON optical zoom lens, optical image stabilization, face detection, high ISO (up to 3200), 2.5" LCD, advanced program modes, and plenty of setting controls. On the negative side, I don't see a custom white balance option nor Raw format. But everything else looks pretty good. 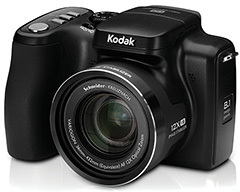 The Kodak Z812 is both Windows and Mac compatible, and according to the Kodak web site, is available now for $299.95 US. This is a camera to keep your eye on. I've got my $49 airfare to Las Vegas, and I'm heading out next week for Photoshop World. This will be my third trip to Sin City this year. You can find me in the O'Reilly booth (#220) conducting live interviews with Deke McClelland, Eddie Tapp, and Mikkel Aaland, as well as other industry notables. These interviews will be podcasted on the O'Reilly Digital Media site and here on The Digital Story, as well as broadcasted so that attendees on the Expo floor can listen in. You can get a free Expo pass for Friday at the show. If you're in town, please come by the O'Reilly booth, introduce yourself as a TDS member, and say hi. 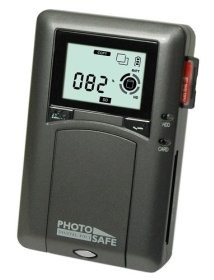 Digital Foci PSF-250: The Best Portable Photo Safe for the Money? For a more reasonable $172, you can get the Digital Foci PSF-250 Photo Safe 80GB Portable Digital Photo Storage with Memory Card Reader. For this kind of savings, you don't get the beautiful color LCD, but you do get 80 GBs of storage, memory card slots for just about every card on the market, and a monochrome LCD featuring copy status indicator that displays percentage completed, transfer confirmation, and number of files copied. Once you return home, connect the Digital Foci to your computer's USB 2.0 port. It mounts just like a regular external hard drive, making image download a snap. The device was among Pop Photo's Editor's Choices for 2007. 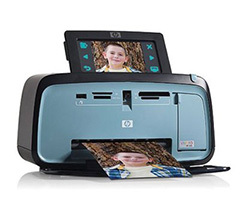 Is the Digital Foci the best portable photo safe for the money? That depends on your tastes. But you have to admit that it appears to be a capable and feature-rich device at an affordable price. File this one under "Things I Knew But Forgot." I recently installed iPhoto '08 and the updated version of the Canon EOS Utility software. Suddenly every time I connected a camera or a card reader, Canon's CameraWindow would launch. It was driving me crazy. Instead of going right to work in Aperture or Lightroom like I wanted to, I'd have to wait for CameraWindow to go through its process thinking it was going to get my photos. I checked its preferences and could not discover how to stop it from launching automatically every time I connected a camera. 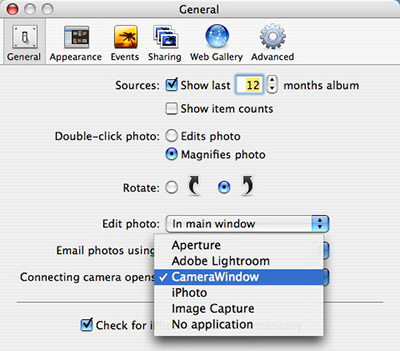 Finally, when nosing around in iPhoto '08, I found the preference setting for "Connecting camera opens." Ah Ha! That was it. iPhoto controls all applications with this setting. I knew that. And guess what was selected in the preference pane? That's right: CameraWindow. I've now changed the setting to "No application" so that nothing automatically happens when I connect my camera... just the way I like it. 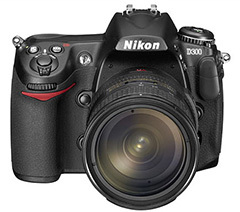 Just a few days after Canon released the EOS 40D, Nikon answers back with the tempting D300. This pro body features a 12.3 megapixel CMOS APS sized sensor, 6 fps burst mode, 3" LCD, ISO 6400, 51-point autofocus system, 14-bit image processing, and a wireless networking option. 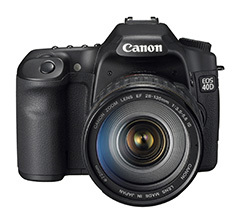 The D300 will cost a bit more ($1,800 US) than Canon's 40D, but also has nice goodies that the Canon doesn't have such as up to 9-frame auto bracketing and EV compensation up to 5 stops. 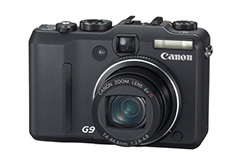 This highly anticipated successor to the D200 should be available in November 2007. For those of you with bigger pocketbooks who want a full frame sensor Nikon, they also released the D3 with the estimated price of $5,000 US for the body. The Park by the Numbers Gallery is new and improved enabling you to upload your cameraphone pictures directly to the gallery via an email address (dstory-813z@gallery.mac.com) or by using the "Upload" button on the gallery web page. So now you can take your photo and add it to the gallery before you leave the parking garage. 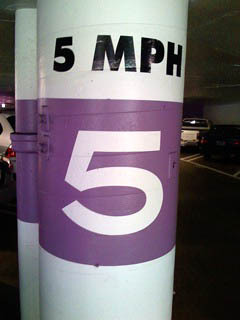 "Park by the Numbers" is a camera phone project that began as a simple way to help me remember where I parked my car in big garages. But as I started to look more closely at these images, I began to enjoy them on the artistic level too, and became interested in taking other types of parking shots. So what started out as a practical use for a smartphone, has evolved into a creative look at an everyday function that many of us have in common. You can learn more about the project by visiting the Park by the Numbers home page. So next time you park your car in a big garage, whip out your cameraphone, snap a photo, and if you like it, upload it to our gallery. It's fun... and it may just help you find your car after returning from a long flight.